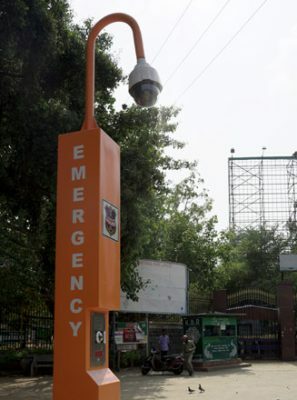 The first SOS Tower has been installed near KBR Park in Banjara Hills. Hyderabad: Getting in touch with the Hyderabad City Police is as easy as pushing a button now. Using what the police call an SOS Tower, people can push a button, talk and explain what their complaint is, and this will be conveyed immediately to the Police Control Room apart from the local police, which is the Banjara Hills police in this case. The first of such SOS Towers has been installed near KBR Park in Banjara Hills. The equipment also boasts of a dome camera on top of the tower to record visuals from the surroundings and also of the complainant. “This is a step ahead in connecting people and police in dire situations. Earlier, for reporting any incident to police, people had to rely on Dial 100 or go to a local police station or register a complaint through the Hawk Eye mobile app. This latest technology will change the way people lodge complaints,” officials said, adding that this was one of the latest advanced technologies that the Telangana Police has been incorporating in its armour to ensure safety for the citizens and to bring down crime. K Ravi Kumar, Additional Inspector, Banjara Hills, said the KBR Park tower was the first of the towers in the city. With the park being an important place for VIPs, celebrities and morning/evening walkers, the SOS tower was installed there, he said. “Thousands of IT employees heading to Hitec City and common people travelling to various hospitals situated in this locality pass daily via KBR Park. It is important to offer high security to them and this SOS tower will come handy. They need not wait for Interceptor vehicles or Blue Colts teams to address their grievance,” he added. The police, in fact, have already received two complaints via the tower, which was installed just three days ago.